Not to be confused with the unfair dismissal process the term wrongful dismissal refers to an employee being dismissed in breach of their contract of employment. This may mean the employee is dismissed with insufficient notice, or if dismissing them in breach of contract they have a claim for damages. An employer can legitimately dismiss an employee without making a notice payment if they are guilty of gross misconduct. Gross misconduct actions are behaviours that justify dismissal rather than less severe misconduct behaviours that require an alternate mode of reprimand or correction. Any compensation or damage award will be determined by the net value of the employee’s salary and the contractual benefits to be paid to the employee if they had been given the chance to work through their notice period. Many employment contracts feature a ‘pay in lieu of notice’ (PILON) clause. An employer can dismiss any member of staff immediately as long as they make the PILON payment and in turn signifies that the notice period can be waved for the employee. 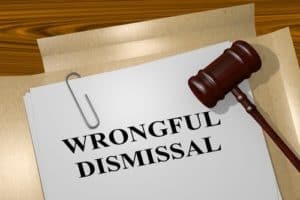 If an employer is guilty of wrongful dismissal this action may free the employee from all further terms bound to them by the employment contract. You should seek professional advice when considering making any dismissal claim against your employer. Employment law is complicated and specialist employment solicitors can help you to determine whether you are entitled to make a claim and if any amount of compensation will likely be awarded. Due to the fact that a wrongful dismissal is a breach of contract the employee making the claim can choose to take the matter to an employment tribunal or the county or high court. The choice of which is often determined by the employment status of the employee, the amount of the claim and any time limits involved. Employment Solicitors Manchester are experienced in all areas of employment law and are the perfect partners to help you decide if a wrongful dismissal claim is the correct process for you and how you should carry out the procedure to determine the best possible results. In many cases of employment termination an employer may approach you with a Settlement Agreement (previously called a Compromise Agreement). This process is handled outside of an employment tribunal or court so it is imperative that you have the correct legal representation to ensure you will receive the best possible outcome and settlement package. You can call on 0161 82 11 559 or contact us by clicking here for an initial consultation regarding your employment position and wrongful dismissal concerns. We will offer you complete and full advice in easy to understand terms to help you to establish the most likely outcomes for your case in a relaxed and pressure free environment.